Commercial trucking accidents are an unfortunate reality in the fast-paced world of today. Roads and highways in San Diego and throughout California are filled with commercial trucks and due to their incredible size, they pose a serious danger to anyone with whom they share the road. 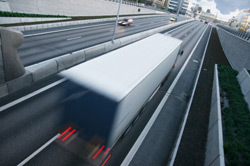 Accidents involving commercial trucks are often times disastrous, leading to serious personal injuries or death. The trucking industry is heavily regulated regarding certain issues, such as how much sleep a driver should have, how many hours a driver can drive, loading procedures, and the weight and type of cargo being hauled. However, with a significant weight advantage against the other motor vehicles, commercial trucks often dominate the roadway. Understanding a trucking accident case requires a thorough understanding of all of the potential causes of such accidents such as driver error, mechanical failure, improper loading, road conditions, or even third party negligence. Personal injury or wrongful death cases involving commercial trucks can be very complicated due to the multiple parties having liability. Given the complicated nature of these cases, a person injured in a trucking accident must seek an attorney who has both an understanding of California and federal commercial trucking regulations and experience in determining the cause of a trucking accident. At Berman & Riedel, LLP, our attorneys have extensive experience in handling vehicular accident claims, including complicated trucking accident litigation. We understand federal and state rules governing the trucking industry, and know exactly what evidence to look for in determining fault and proving liability. Our attorneys use their experience and talent to maximize the damages recovered on behalf of our clients, including past and future medical expenses, lost income, and pain and suffering damages. If you or someone close to you has been involved in a trucking accident in San Diego or the greater California area, our attorneys can offer the skill and experience necessary to maximize your claim and set you on the path or recovery. Contact a San Diego auto accident lawyer at Berman & Riedel, LLP, in San Diego for a free consultation to discuss your case.